Freelance copywriter, content creator and Hootsuite Certified social media manager. 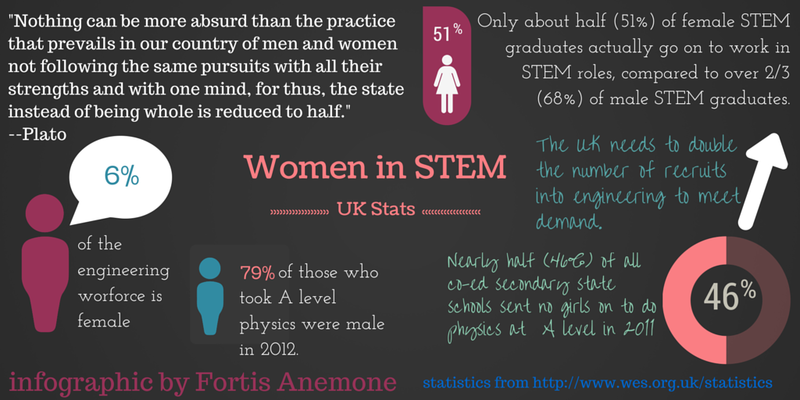 I went to a lecture hosted by Liverpool John Moores University last week, part of their women in STEM series. they have some fairly prestigious speakers lined up over the coming year, but the inaugural lecture was from The Rt Hon Andrew Miller MP. It was also chaired by Prof Robin Leatherbarrow. With a lack of female role models so often cited as a barrier for women in STEM, this seemed like a major missed opportunity at best, and a huge insult as worst. Now, I have a great deal of love for LJMU. I gained my BSc in Applied Psychology there and found their support and teaching to be exemplary. There were many women in key roles, all of whom seemed to be on an equal footing with the male faculty members, so I had no sense that being a woman would in any way be an issue should I have carried on into a career in Psychology. So to receive an invitation to a lecture supposedly supporting the promotion of women in STEM subjects that couldn’t even find a woman to chair it, made me feel not just the usual anger but also disappointed. I had felt an enormous sense of empowerment while studying at LJMU. I started the course at a particularly low point in my life personally and came out of it stronger than I have ever been. Gender simply wasn’t an issue; you were an academic and you were supported to achieve your potential, full stop. Period. I have been feeling recently that feminism has taken a marked step backwards in so many areas, too many to delve into here, had this spread to my alma mater too? It was with trepidation that I headed off to hear the MP speak. I have to admit, I was ready to write a scathing blog about the whole experience. The event started off with a networking session, with students, academics and professionals from across the country. I had some of the most fascinating conversations I have had in a long time; we discussed feminine and masculine thought processes, facts vs creativity, how the two can be used differently and the need for both to spark true innovation. I also spoke to someone who had read the same article I had, about the idea of a default parent. All too often, this is the female in hetero relationships (the intersectional issues here deserve their own blog at least!). This then led to a different discussion. If the female scientist, or engineer, or any professional really, is also the default carer then she has both the professional pressures and familial ones to deal with too. Add to this that, to be considered a leader in her field she will have been working for at least ten or maybe even twenty years, she will probably have older parents to care for as well. The drain on her personal resources will be enormous. Add to this the fact that there are simply less women in senior positions within STEM, and the pressure on those industry leaders is suddenly immense. So I started to think a little differently. If women didn’t create this problem, why the hell should it be our responsibility to fix it? I am not suggesting that ‘we’ need ‘men’ to solve ‘our’ problems; I am suggesting this is men’s problem and they should start fixing it. The lecture itself was fascinating. Mr Miller referred to a government white paper specifically focusing on women in science and research, which identified that archaic working practices that were not family friendly, a lack of mentorship and the pace at which fellowships needed to be achieved all disproportionately affected women as they were effectively, the default carer in their families. he also talked about how the lack of women in research was not just a disservice to women, it was a disservice to Britain. The country was missing out on brilliant minds simply because it couldn’t be flexible enough to retain them. Women are often the default carers due to the ability to not just retain information but to make connections between the seemingly disparate pieces of data. When a child asks where their toy is they can remember what the child was doing three days ago and so extrapolate where the toy would be. Hence the child asks them first. This skill, this way of thinking can lead to enormous innovation, as the seemingly disparate pieces of data gathered in and across experiments and investigations can be linked in ways that have not been perceived before and applied in ways that turn the theoretical into the practical. If a sports team wants to sign a key player, that will improve the whole team, they meet their demands. Well, STEM, you need women on your team, and we demand family friendly working practices and support for senior women so they can support us. Get on it. This entry was posted in Uncategorized on November 22, 2014 by Fortis Anemone. I went to a meeting about growth accelerator programmes a couple of weeks ago. The company behind the particular programme had invested in a tech-based company from Liverpool and wanted to see if there were any other brilliant propositions to get on board with. Now, I am proud of my home town and I am especially proud of its burgeoning tech community with groups like Liverpool Girl Geeks, DoES Liverpool, Connected Liverpool and of course Baltic Creative Campus leading the way from the independents and of course our massively respected universities. What didn;t make me proud was that out of the 15 or so people these, only 2 others where women, one who had popped into see what was happening having been at a meeting next door, and one who was these representing a women in business support organisation. I was the only other woman vaguely connected to the tech side of business and my link was tenuous. Looking around the room, having rapidly realised the accelerator programme was not for me, my mind started to drift. Why weren’t there more women here? I have always been a bit of a feminist. My extended family was certainly more make than female growing up, but was dominated by strong women, so I never felt I couldn’t do anything the boys did and neither did the boys. There was no boys vs girls atmosphere, we were all just kids. It was empowering at first but also confusing when, as I grew up, I increasingly encountered boys and men who saw me as different to and, frankly, less than themselves. I simply had no idea how to handle that. My initial confusion eventually led to a low level of militancy, choosing my battles but fighting them well. The main man in my life growing up was, and is, one of the people with the most unshakeable belief in me, who never assumed anything about my interests because I am a girl. He is the reason I adore football, why I knew the offside rule at the age of five and why I love rock music. he is also a mathematician, so I know that my decision to follow an Arts based path in life was not for a lack of a role model within my family. My career decisions have always been based on a combination of what makes me happy, what I am good at and what my annoyingly present medical condition allows me to achieve. But I was really good at Maths as a child. My dad once let me have a go at a mock GCSE when I was 9 and I passed. He even went as far as showing his class my test result to motivate them, because I beat most of their scores. (Side note, this has a whole story attached about the one week I was cool in primary school, but that is for another, more personal blog….) So, why, when my career choices have been based on what I am good at, did Maths not factor in at all? I have to look outside my family. In school, science lessons were pretty dull, They must have been, I can only remember one of them and yet I can recall almost every book we read as a class and many of the history projects. I know from my own teaching experience that the more passionate a teacher is about a topic, the better they can teach it. So if, growing up, the only teachers I had were women, who had little or no understanding and enthusiasm for science this is no wonder. The only woman I can genuinely remember seeing involved in anything remotely STEM related on TV was Judith Hann presenting Tomorrow’s World. While I can now look back and recognise just how freaking awesome that made her, at the time, she definitely wasn’t what a ten year old could call cool. The presentation of women and STEM in wider society may well have contributed to my decision and while I am happy with my path, that doesn’t mean others should have their options limited. I think I may have chosen another battle. This entry was posted in Women in Tech and tagged feminism, feminist, girls who code, heforshe, technology, women in tech on November 12, 2014 by Fortis Anemone. 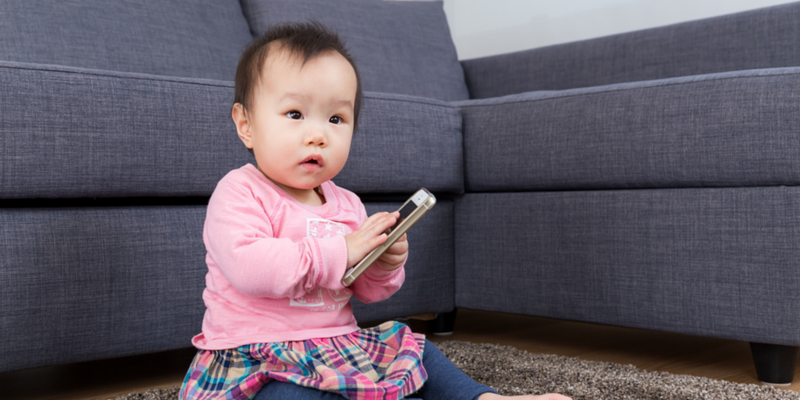 Please put the phone down darling…look – over there – Peppa Pig!!! The imagery associated with the new wave of wearable technology such as Apple Watch and Google Glass has been fairly standard up until now. Busy corporate hustlers looking ever forwards, tapping their watch so as not to miss an update. Joggers incapable of going ten minutes without checking their twitter feed whilst still having impossibly perfect hair, their steely concentration emphasised by their Net-a-Porter designed frames. These images represent the target demographic – young, successful millenials, as well as providing the all important aspirational figures for the rest of us mere mortals who couldn’t string a coherent thought together if they had to jog, let alone read the paper. But Apple and co. might just be missing a trick. My friends don’t check Facebook as often as they used to, not just because they are constantly chasing around after their kids, but because they can’t have their phones handy for fear of them being slobbered on, eaten or flushed down the loo ‘to see what happens’. Most parents that I know are now using their trusty Nokia from 2005 because they can’t afford to replace their smartphone again and so can now only play Snake whilst marveling at how impressive they used to think the torch was. The biggest threat to Apple isn’t someone hacking the iCloud for naked selfies: it’s toddlers. Apple’s recent TV ad was actually called parenthood – my favourite part was the bit where the dad tries not to freak out on his implausibly cute son after he sprays his £600 phone with water in the garden. Parents are on Apple’s radar but they and their competitors seem not to have realised that most mums and dads would snap up something that allows them to engage in the adult, digital world that their children – who they love very much – are increasingly taking them away from. A way to maintain their link to their friends, businesses and their social networks that can survive a nappy change unscathed – now there is tech that parents can get excited about. This entry was posted in Uncategorized on September 18, 2014 by Fortis Anemone. 5 questions to determine your social media platform choices. There are new social media platforms emerging all the time, sitting alongside the established spaces such as Facebook and Twitter. So how can a small business choose where to focus their limited resources? These questions should help you determine where to post and why, maximising the ROI for your time and energy. This entry was posted in Uncategorized and tagged Facebook, Instagram, LInkedIn, Pinterest, platform choice, social media, social media management, social media strategy, target audience, Twitter on July 21, 2014 by Fortis Anemone. Consistent brand voice is crucial when marketing your business through content. What does this mean for the small business, perhaps just starting to outsource for the first time? This entry was posted in Uncategorized and tagged blog, blogging, brand voice, choosing a copywriter, content, content blog, copywriting, crafting a voice on June 25, 2014 by Fortis Anemone. Determining target audience is one of the most crucial decisions that a business needs to make. How did Fortis Anemone determine theirs? This entry was posted in Uncategorized and tagged brand story, choosing a copywriter, content marketing, demographic, determining target audience, engaging content, engaging content writing for small business, target audience, user-centric copy creation on June 9, 2014 by Fortis Anemone. This entry was posted in Uncategorized and tagged autobigraphical, blog writing, content, copywriting, freelance, self-employment on May 26, 2014 by Fortis Anemone. Want more information? Why not like our Facebook Page? Why not follow us on Twitter?